Inevitably, Capcom has announced a new game in its Lost Planet series, and we've got the details to prove it. The House That Mega Man Built (before he was casually discarded to the hilarious dismay of overly excitable fans) recently held its annual Captivate media showcase in Rome, and the biggest announcement to emerge from that event was the unveiling of Lost Planet 3. That trailer you see at top is the first official look at the game, and despite being entirely in Italian, is a pretty solid primer for what to expect. Namely, frigid conditions and biologically improbably insect analogues. That should come as no surprise to fans of the series (snow and stupid-huge bugs are the series' two major hallmarks), but the story here is all new. Lost Planet 3 focuses on a rugged (yet apparently self-sacrificing) rig pilot who travels to the frosty climes of E.D.N. III to work for Neo-Venus Construction. Given the planet's inhospitable climate, this is dangerous work and Jim (that's his surprisingly boring name) hopes to use the gig's lucrative pay to support his family. Unfortunately, the company's Thermal Energy reserves run low, prompting Jim to set out in search of more (or, more specifically, in search of a large enough cache to earn a hefty paycheck and an early ticket home). Even more unfortunately, there are a ton of the aforementioned stupid-huge bugs standing between Jim and his windfall. And, if I know anything about Capcom, there will also likely be a few shady humans bent on making his life more difficult. That's just how this sort of thing works. 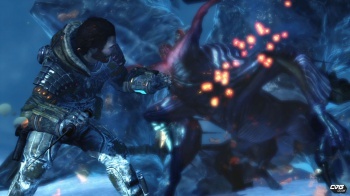 While we don't know much about Lost Planet 3's gameplay (beyond the requisite "there will be both singleplayer and online multiplayer modes," and that it's been described as an open-world prequel of sorts), we do know that it is being developed by Spark Unlimited, a relatively unknown studio most famous for its work on Call of Duty: Finest Hour. Whether this instills confidence or anxious confusion is entirely up to you, though I do give the firm credit for crafting a solid debut trailer. Lost Planet 3 is scheduled to hit the Xbox 360, PlayStation 3 and Windows PC platforms at some as-yet-undetermined date in 2013. Expect increasingly large info dumps from Capcom as that deadline approaches.